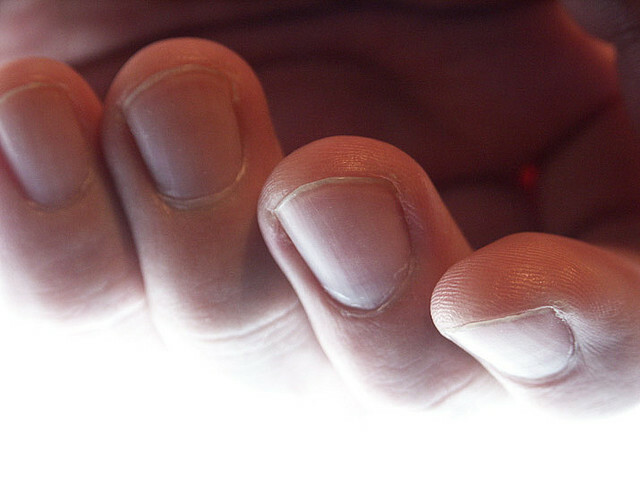 FINGERTIP BIOMETRY – Fingertips Signal Clues for Schizophrenia! Many studies have revealed that syndromes & diseases become manifest in hand functions & many aspects in the morphology of the hands. Interestingly, a closer look a the studies performed so far indicates that for the hand in schizophrenia the significance of the fingertips is more important than in other disorders! A person diagnosed with schizophrenia may experience hallucinations (most reported are hearing voices), delusions (often bizarre or persecutory in nature), and disorganized thinking and speech. But there are no symptoms which are seen in all schizophrenic patients. NOTICE: The ‘positive symptoms’ in schizoprenia are those symptoms that most individuals do not normally experience but are present in people with schizophrenia (such as: hallucinations & disordered speech). And the ‘negative symptoms‘ are deficits of normal emotional responses or of other thought processes, and respond less well to medication (such as: blunted affect & poverty of speech). FIVE FINGERTIP DIMENSIONS IN SCHIZOPHRENIA! – 1b: fingerprint type asymmetry on 3 or more fingers. – small & underdeveloped (prevalence: 18.8% in schizophrenics vs. 2.0% in controls). – 3b: spatulate is typical (prevalence: 42.4% in schizophrenics vs 21.7% in controls). Interestingly, there appears to be a connection as well regarding how schizophrenia is linked with the brain! Because after Penfield described in his cortical homunculus (see the picture on the right) in the 1940’s how the primary somatosensory cortex is linked with e.g. the fingertips, brain studies have later revealed that schizophrenia is often featured with abnormalities in the same region of the brain (+ other near located parts of the brain, including: the thalamus & frontal lobe). The following summary shows that only three out of the five fingertip dimensions that provide significant clues for schizophrenia, also display significant clues in 6 other diseases & syndromes that are well known for displaying significant hand markers. Only rheumatoid arthritis provides clues in these three fingertip dimensions! Significant for the hand in Down syndrome, the hand in diabetes mellitus, the hand in fragile-X syndrome, and the hand in rheumatoid arthritis. Significiant for the hand in Down syndrome, the hand in diabetes mellitus, the hand in Marfan syndrome, the hand in psoriasis, and the hand in rheumatoid arthritis. Significant for the hand in Marfan syndrome, the hand in psoriasis, and the hand in rheumatoid arthritis. No significant markers for any of the six studied diseases & syndromes. These materials indicate that a significant part of the correlations between the hands & schizophrenia is found at the fingertips. To be continued! 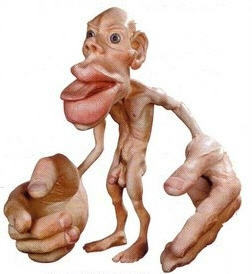 Penrose's brain homunculus describes how the fingertips relate to the primary somatosensory cortex & the primary somatomotoric cortex. « Nailfold Blood Vessels reveal a Biological Marker for Schizophrenia!